The Stage 2 Houston Deposits are located in Labrador, about 15 km from the James Mine and Silver Yards processing plants and 20 km from the town of Schefferville. Houston is planned to form the core of LIM's activities for the next decade. Together with the Malcolm Deposit, considered to be its northwest extension, the Houston deposits are estimated to contain a NI 43-101 resource of 40.6 million tonnes grading 57.6% iron Fe. When in full production, the Houston-Malcolm deposits are expected to produce consistent saleable product of about 2 to 3 million tonnes per year, with an initial mine-life of 8 to 10 years. Refer to Houston Technical Report filed on SEDAR. The Houston deposits have an average in-situ grade of ~57% Fe that is expected to be upgradable to a 60% to 62% Fe iron product. The Houston-Malcolm deposits are expected to produce consistent saleable product of about 2 to 3 million tonnes per year, with an initial mine life of 8 to 10 years. The development plan for Houston is relatively simple. The major component consists of constructing an 8 km gravel road, including a bridge over a river crossing. The new road will connect to an existing road located near Redmond Mine, which leads to the Silver Yards facility. The overall one-way distance by road from Houston to Silver Yards is approximately 20 km. Including initial mine development, the initial capital investment to develop the Houston Mine is expected to be approximately $20 million. During 2014, the Houston development plan was revised in response to lower iron ore prices and in order to reduce up-front capital. The revised plan is based on lower-cost dry crushing and screening only, with deferral of the originally proposed wet plant. The Silver Yards wet plant will be maintained in standby condition and may be re-commissioned to process lower grade plant feed from Houston and, potentially, production from other deposits in later years. It is also planned to construct a new rail siding near the Houston Mine. When the rail siding is complete, it will be used in conjunction with the Silver Yards rail siding to increase train loading capacity up to approximately 3 million tonnes per year, and will reduce the operating cost of overland haulage from the Houston Mine to the rail head. Development of the Houston Project is subject to the availability of financing. There are no assurances that the Company will be successful in obtaining the required financing and if the Company is unable to obtain such financing, the development of Houston will be postponed. Following LIM's submission in 2011 of a project registration to the Gov't of Newfoundland and Labrador for the development of the Houston #1 and #2 deposits, including a haul road and railway siding, the Minister of Environment and Conservation informed LIM in March 2012 that, in accordance with the Environmental Protection Act, the Houston 1 and 2 Deposits Mining Project was released from further environmental assessment, subject to a number of conditions. LIM has subsequently received surface and mining leases, and a construction permit for the haul road and rail siding. Basic engineering is complete and a civil contractor has been selected for the road and bridge construction. 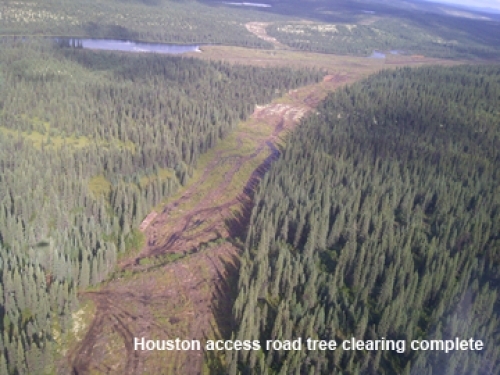 In March 2012, the Minister of Environment and Conservation the Gov't of Newfoundland and Labrador informed LIM that, in accordance with the Environmental Protection Act, the Houston 1 and 2 Deposits Mining Project, including the haul road and railway siding, was released from further environmental assessment, subject to a number of conditions. In February 2013, the Company filed registration documents with the Government of Newfoundland and Labrador and with the Federal Canadian Environmental Assessment Agency (CEAA) for the second phase of development of the Houston #1 and #2 deposits, which includes the construction of a wet process plant incorporating crushing, screening, washing and magnetic separation. This plant will be capable of upgrading lower grade ore (50% to 59% Fe) into saleable sinter and lump products. In April 2013, CEAA notified LIM that a Federal Environmental Assessment was not required and in May, the Minister of Environment and Conservation for Newfoundland and Labrador released this second phase of the Houston Project from the provincial environmental assessment process, subject to conditions. This environmental release of the second phase of the Houston Project will allow LIM to complete the applications for permits and regulatory approvals required for the construction of the wet processing plant for the Houston Project. The Houston deposit is stratigraphically and structurally controlled, consisting of hard and friable banded blue and red hematite that locally becomes massive. The texture of the high grade mineralization varies from massive compact to fragmental/broken layers of steel grey to red ochre color. The unconsolidated layers can become very friable to sandy in texture, a feature commonly found throughout the Houston deposit. Previous airmag data suggests that the iron ore is concentrated along the west flank of a modest to strong magnetic feature, which trends approximately N330 degrees. Houston 1 and Houston 2S are not coincident with the strong magnetic feature. Previous drilling carried out by LIM indicates that the majority of ore in the Houston deposits occur within the upper iron formation (UIF) and middle iron formation (MIF) with lesser amounts in the SCIF (silicate carbonate iron formation). The amount of red ore associated with the Ruth Formation appears to be minimal if not absent. Ore in several holes is noted to terminate in a red chert, believed to be the Upper Red Chert member that occurs at the boundary of the MIF and SCIF.